I had my best conversation with Antonin Kratochvil in New York last year after he had been mildly reprimanded for swearing during his presentation in the Canon booth at PhotoPlus Expo. I thought to myself at the time, "Well, then, why the hell did they put Antonin up there in the first place?" Anyone who knows this gritty photographer is aware that he is going to say what he thinks. Antonin has a gallery here at the LOOK3 Festival, and was the featured speaker last night at the Paramount Theater. If you haven't seen his work, or know the story of this tough, emotional photographer, then you owe it to yourself to find out more. 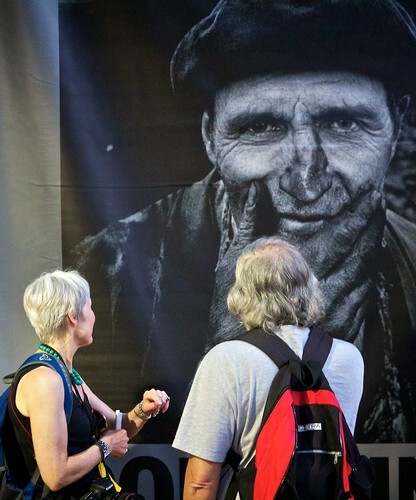 Couple interacts with an Antonin Kratochvil portrait at the LOOK3 Festival in Charlottesville, Virginia. Photo by Derrick Story.